Thanks for the EFI. Do you have the settings required for clover please ? Hey, thanks for the EFI directory. With vanilla 10.12 it works great! Was there anything else required to get brightness controls working? For one reason or another, using that EFI 10.12.4 directory doesn’t allow be to control brightness with the keyboard, and no brightness options are listed under System Preferences -> Display either. Also, the OP’s issue with sleep and wifi button may be related to the card he’s using – sleep works perfectly for me, as does the wifi/bluetooth hardware button. I tried to get AppleALC working for a more native audio solution, but it would only playback through headphones instead of internal speakers. It also caused some weird shutdown issues for me. Sticking with VoodooHDA in EFI for now. Thanks for sharing, I’ll try out your fixes on my machine. Do you mind if I mirror your EFI folder in the post for the sake of completeness? Run Kext Utility, wait till it finishes processing, reboot. Brightness adjustment should work after that. I suspect it’s repairing permissions or updating some of the cache files that makes the difference, but for me it’s just easier to run kext utility and have it do all of that for me. Note that no kexts are actually being installed in the last step, the utility just repairs some permissions/caches. Hey , I bought HP branded Bcm943225hmb , but no BLUETOOTH icon in system preference. So i saw you give feedback that you have the same card and everything working . could you help me to get bluetooth working ? I found the problem in my card , i have to put my mac in sleep mode before using Bluetooth. The Bluetooth icon is appear after wakeup from sleep .may be the problem in power management file . Hi C.P, do you get problem while using bluetooth? When I connect speaker via bluetooth, the wifi is automatically turn off and no way to turn it on. After a reboot, wifi works again. I’m using same Bcm943225hmb card like you. 4- restart you new mac, enjoy . What is your display resolution, your hp folio 9470m support the resolution 1600×900? no , my screen resolution is 1366×768 . why ? I have a problem with screen. After restarting the resolution is very low and image seems to be extended and i see only half screen… what can i check? If you’re using 1600×900, I updated DSDT for support this resolution. Hi, do you plan to update on High Sierra/Sierra? Is everything working for you so far? I wanna to hackintosh this laptop too, as I have Windows 10 here right now, using 1600×900 resolution too. In other words, what are your issues with this hackintosh build, so I will now if it’s even worth. Thank you! After replaced wifi card to a BCM943225HMB, I’m using El Capitan and Sierra perfectly. There’s a very small issue that I cannot turn off bluetooth, but it doesn’t matter. Everything works smoothly: wifi, external display (Display Port), sound, battery. I’m developing hybrid app for iOS and Android with no issue. Now I stay with Sierra, I’ll try to install High Sierra later. Okay, thank you. One more question, when I install macOS (high sierra probably), all I have to do to have all patches and fixes is to load your EFI which you linked above? Thanks. Oh…and is your wifi card with bluetooth 4.0? Yes, put my EFI folder into EFI partition. After a fresh install, you should rebuild cache using Kext Wizard. I don’t know if it works on High Sierra. It can be used for ElCapitan and Sierra. I’m not sure BCM943225HMB has Bluetooth 4.0. You can do some search. No it doesn’t unfortunately. I will try to find different card then. Thanks. One more question sir…how did you bypass HP bios whitelist? Did you mode it? i installed mac Sierra , and everything working well . but my lap didn’t do sleep. any help for this issue ? The problem is i didn’t disable wakeup on lan . So please take care to disable the wakeup on lan from BIOS . I installed macOS Sierra with the EFI folder correctly installed, and when reset the integrate display only showed half screen, the second monitor works fine. I have the same graphic problem, have you solved? This worked for me. But I’m having 2 issues, I can’t see my battery percentage and my volume doesn’t work. Also a bigger issue is the laptop won’t turn on when I press shutdown while the power cable is plugged in. and use the app to install voodoohda.kext into your high sierra efi folder. Can you please guide me how to make an installation USB for Sierra? I’m using El Capitan but I can’t install Sierra. Someone try install high sierra on this laptop? I did, it’s as cool as Sierra. You can try it. You can explain how you did it, I tried to do it but it gave me flaws. What issue did you get? You can share your EFI folder for high sierra? apfs? thankssss!! Wow! Osman thanks you for your contribution. how do you create a usb high sierra from windows ? Hey , actually i did create the USB in Sierra NOT in Window . Thanks Osman & Ngoc. I finished my installation correctly. Hi Osman I used your EFI folder thankyou! but i have a problem, the sound works perfectly but is impossible down sound in bar sound, yo can down the level in bar but the sound not down. yeah same here about sound bar.hope i can find a solution soon. Thanks Osman if you repair this bug you could share your efi folder. I promise, but now i/m searching for another issue after upgrading to high Sierra the Trackpad panel is empty . did any one faced this issue ? 3. Press CONTROL-W (^W for search) and search for the string “VoodooHDAEnableVolumeChangeFix” (without the quotes). Change the value from false to true. Save the file. 5. reboot your machine and the problem is solved. Thanks Ngoc and Osman, congratulations for your great work!!! Thanks Ngoc Tran, noax . the sound bar issue is solved . I found the Solution for empty Trackpad after upgrading to High Sierra . and my Trackpad now is working well . Thanks! This EFI folder helped me to install Sierra on my 9470m. Have you tried High Sierra yet? Thanks, that worked! Any kexts for SD card reader under High Sierra? A ơi cho e hỏi , cái EFI trong github của anh có chạy được 10.13 không ạ? Should I be aware of any further changes on EFI folder when I have The 9470m with a Intel Core i7-3687U (2x 2,1 GHz)? Have you shutdown completely then turn it on? Yes i’ve done that. In fact it’s at the beginning of High sierra install at boot. Hi, this gets everything working but for me, WIFI isn’t working. I have a Broadcom 943224HMS card (which I think is the same as your DW 1510). Any ideas? Thanks in advance. I have same WiFi card, the card is working without any modification. Do you mind sharing the guide you used for this model laptop? I’m able to get it sorta working using a video I found but would like to look over the guide you used. I see the guide now, I’m having an issue with the install I’m using, it will update from app store and cause mine to no longer boot, thoughts? Hi Osman, Can you please release your 9470m 1600×900 i5 EFI folder for 10.13.1 ? Mine goes all the way, but when the installer reaches the end I get a general message stating I should try to re-install High Sierra again,and that stays in a loop…. Hi please I need help. I have a 9740m when I try to boot from usb (done with unibeast) it reboot at the Apple logo. Have you replace EFI folder by the one provided in this post? Thank you for the efi that I downloaded here. My USB works now with the EFI. My Problem now is that no audio is coming out to the display port. Can someone help me? My OS is High Sierra 10.13.2. Thanks in advance. Try to open “Audio MIDI Setup”, change Digital-out (HDMI)’s format to “8 ch 16-bit Integer 48.0 kHz”. Hope this works. Will it be possible to have EFI for High Sierra with 1600*900 resolution, i have tried Osman EFI files but i have a black screen at install menu. Thanks you very much for you reply but the link doesn’t work. thank’s, this link is ok but i have tried everything and it doesn’t work with High Sierra, Sierra works perfect but this file with High sierra i don’t arrive to install windows! What did you get while installing? I’m using it for High Sierra, see my browser’s agent above? Hi Ngoc Tran; I will arrive home after travelling for a week and will definately try your hp 9470m on mine. Will let you guys know my findings. Merry Christmas ! I’m getting mere 1 hour battery life. I am using EFI folder link of which you have posted in the article. Does this mean there’s problem in power-management? I have Elitebook 9470m with 1366×786 resolution. CoconutBattery tells me my battery capacity is 2187mAH. Voltage is 16683 mV, putting my battery at 36.5 Whr but isn’t the battery supposed to be 52 Whr? Intel Power Gadget app tells me my CPU and GPU vary their frequency (GHz) depending on processing load, so CPU and GPU power management is somewhat right but why such low battery life? Can we modify something to get more battery life? How much battery life others are getting? How did you get the webcam support working? I also followed RehabMans guide and got everything working except the webcam and mic. Did you also get the broadband module working? For microphone issue, try some options in System Preferences -> Sound -> Input. I see my microphone under Sound but it doesn’t work. I plugged in some microphone capable speakers but they also don’t work. Bluetooth also doesn’t work with the Broadcom WiFi+Bluetooth Card but WiFi does. Like to thank the people on this site who posted their EFI and solutions for this model. I now have a High Sierra up and running after spending 2 weeks trying to get Graphics to Work – Had grey screen after booting and could only load OS using a FakeID. I now have 1600*900 thanks to Ngoc Trans ACPI settings. I have ordered a DW 1510 Broadcom for Wifi – so cannot verify it but all other items mention working in this post are working for me. Do you use bluetooth properly? When my bluetooth speaker is connected, wifi icon is refreshed and totally lost network sometimes. Then I must reboot system. Thank you for confirming that. Can you give me full model name of your wifi card or somewhere you bought it? I should buy one like yours. Bought on Ebay From Cityeliter Model BCM94360HMB Azurewave AW-CB160H I looked and he is still listing them for sale and I highly recommend him. It has smaller wires than what is presently in the Laptop and requires 3 antennas. I had him ship me 1 Mhf4 Antenna and 2 of the connector ipex4 to Ipex 1. I connected the antennas in the computer to the outside terminals I think they were 3 and 5. I added the middle terminal to the new antenna. Connected to my network I am getting as high as 75 mb downloads which is impressive. Definitely an improvement from when the laptop was windows. I was suppose to receive it on April 8th but it arrived almost a month earlier. I had an issue after installing the WIFI because I changed my BIOS settings and then it required me to restore a backup to get it working again. What happened is I checked both Wireless Button State and LAN/WLAN Switching which caused my wifi to turn off and I could not turn it back on from either WIFI settings or using Terminal. This is what I am using in BIOS with no issues. I just bought the BCM94360HMB Azurewave AW-CB160H from the same seller you mentioned but forgot to ask him to ship the Mhf4 Antenna, now it’s installed but doesn’t work. Can you snap a picture of the card with the Mhf4 antenna so I can order one on Amazon. Right now I can’t picture what it looks like. Thanks for your time. I noticed Ngoc Tran uses an i5 version. For those of us with an i7 do we need to follow rehabman’s instructions to generate an SSDT.aml? Instructions for using it are provided in the README. I think i5 or i7 is not a matter. Folio 9740m Working fine with DW 1510? No any problems with compatibility with motherboard?? I believe that on latest BIOS this laptop doesn’t have a WiFi card whitelist anymore. to use HDMI Audio, try to open “Audio MIDI Setup”, change Digital-out (HDMI)’s format to “8 ch 16-bit Integer 48.0 kHz”. Hope this works. Did you try the “Extra .kexts for SD card reader: JMicron.zip” further up this page. It includes the zip file for the kexts. I do not use SD card so I never tested the file. Has anyone setup a dual-boot configuration (Win 10/Sierra) using both the mSATA and a 2.5 SSD? If so, how would you recommend I go about doing this? Sorry I’m such a noob. Do you think partitioning the 2.5 SSD and dual booting from there would work? Yes, that’s the way I’m using both 2 OS. 1. Setup Mac on your machine. 15. Backup the Microsoft folder in there, so if something happen to your EFI partition or your clover partition, you can reinstall Hackintosh and paste the Microsoft folder into the EFI folder that exist in the EFI partition after you finished, so you can log to installed Windows again. You too ? VGA port Not work ? Figured it out…just had to reformat my usb and start again. Helpful tip, make sure CSM is disabled (Native UEFI) in the BIOS and in Clover Configurator set the proper screen resolution (under the Gui tab) to make the clover boot screen appear at the proper resolution. Thanks to Ngoc Tran for posting his EFI with the 1600×900 resolution file. 3) Battery life under OS X Sierra is 1hr versus the 3+ hours I get under windows 10…might this be the speedstep aml that needs to be generated for the I7? 4) Disabling the requiring password after sleep makes me feel uneasy. Has anyone found a solution for this? I’m grateful to you providing us – the owners of 9470m – with EFI folder, I setup Sierra and updated the EFI folder with the one you uploaded, and every thing working excellent, except the intel HD 4000, the resolution is excellent and VRam is 1593, but it’s lagging I don’t know why? So What do I have to do to make it smooth? I’ve Resolve it, By resitting the Bios Settings to the defults. Good news for audiophile, I have patched an AppleHDA kext work on all Mac version so you don’t need VoodooHDA anymore, now you have better speaker and better mic, auto detect headphone and etc…, I only can say that it really native. Please install my DSDT in ACPI/Patched and DummyHDA, CodecCommander kext in Kexts/Others. Note that you must use my DSDT(I re-compiled from Matthieu’s DSDT to make AppleHDA work). This is the Clover folder work with 10.13.3 and you can upgrade to 10.13.4, please don’t try to install 10.13.4, I can’t make 10.13.4 installer work (you still try it). I also updated all kext and clover bootloader to lasted version. Do you miss any configurations in plist file? i’ve been a this for a couple of days now. at first the installer would not boot for me. double and tripple checked BIOS settings. they are all good . problem i have now is. i was able to install it. but whenever i boot clover. it does not see any drives. not the install partition on the USB drive nor the installed sierra/high sierra (tried both several times) did anyone encounter this issue and came up with a solution? aout ready to pull my hair out and just revert back to windows. I was also frustrated with the missing “Install High Sierra” boot entry. I cracked it. 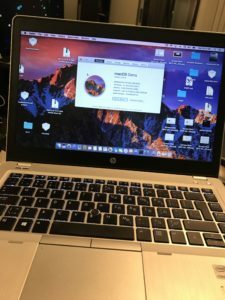 Use Unibeast 8.3.2 to install high Sierra installer on usb stick. Use clover configuration to mount the efi on the sub stick. Clone ngoc latest efi from https://github.com/ngoctp/clover-uefi-hp-folio-9470m-1600×900. Replace /efi/clover/kexts on the stick with ngoc’s /efi/clover/kexts. Boot the stick and install high Sierra. Thanks to Matthieu for starting the ball rolling on 9470m hackintosh. 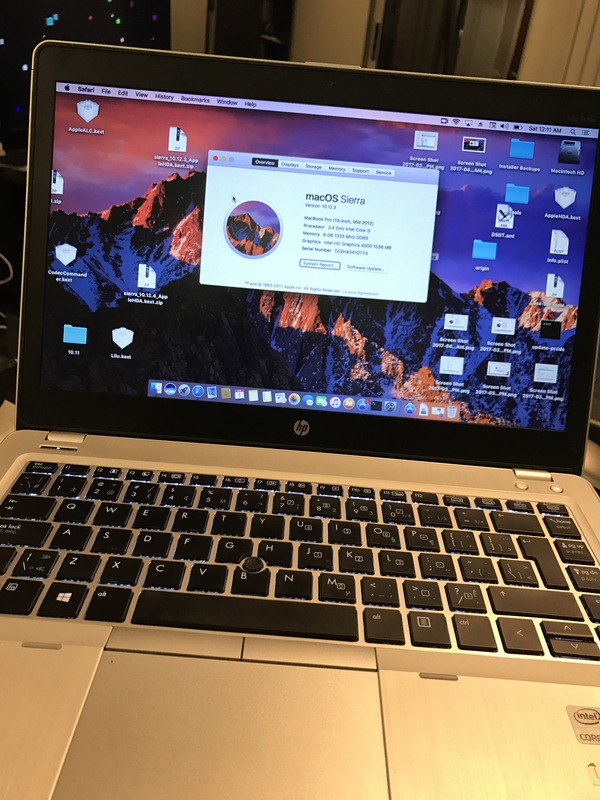 Thanks to Ngoc n Osman for sharing your awesome efi so that hackintosh newbie like me can enjoy. THX!! i got a step further. it booting to clover OK. however. i get an ACPI error now. ACPI Error:Method parse/execution failed. this repeats like a thousand times until it seems to reach the installer but with a black screen. What is your 9470m spec? I no longer have access to a mac with the install MacOS application but i did manage to create a unibeast thumb drive. Is there a way to replace the EFI in the Clover bootloader with the EFI you reference from ngoctp? If u r gonna install Mpjave then use this EFI. HWMonitor – CPU and GPU sensor hidden. The CPU (i7 3687U) is running at high speed and warming up. I have installed the following adrese screen image. Hello, sorry for my bad English. I installed High Sierra on my 9470m i5 and replaced the EFI folder with Ngoc Tran and started with the new clover but the resolution remains the same at 1024×768 and did not change to 1600×900. I missed some procedure? can you help me? and this without saying that I still need to show the battery and other details. Thank you. Hello i’m on High sierra and my volume is too low i’m using VoodooHda 2.9.1 how to resolve problem? Hi, Can someone help me please? I copied the EFI folder but it does not change the resolution. Follow 1024×768. Thank you. Hello guys can someone help me? Anyone try to update to Mojave yet? For anyone having problems with the JMicron Card Reader, you have to install two KEXTS – JMB38X.kext and HSSDBlockStorage.kext. They both have to be installed in the /Library/Extensions/ folder. They DO NOT work when just installed in the clover boot EFI/Clover/kexts/other location. 1. In terminal, change current directory to your boot EFI/Clover/kexts/Other folder. Ignore any errors about invalid signatures. You will not see the card reader in the standard Apple Hardware list. However, when you insert an actual card, it should appear under devices in Finder. With APFS system disable trim in clover configurator. Reduced boot time from 30 sec to 23.
today I installed Mojave 10.14.2 on my 9470m / i5 / 1600×900. Thanks to all your hints it did run quite smoothly! WTG! Webcam working, card reader working, Bluetooth and Ethernet working. – WiFI … which replacement card would you recommend for the 9470m and Mojave? Did you upgrade from 10.13 to 10.14? Would you mind sharing your Clover and /Library/Extensions folder? i see cannot convert to afps! any help?? Take a photo of last error message when the installation is stuck. What is your hardware? Apfs is the default file system on the boot disk for Mojave. Thanks yahgoo! Would you be so kind as to list the exact steps you performed? Great to have folks like you! I wanna take this opportunity to thank Matthieu n Ngoc Tran. I bought my 9470m after reading Matthieu’s blog. My High Sierra and Mojave hackintosh would not have been possible without Ngoc’s EFI. I am still trying to figure out how to fix graphics and audio with the new methods of Lilu.kext, whatevergreen.kext and Intel FB’s patcher. Can anyone confirm or deny that dual boot (win10 and macos) with two separate drives (msata and 2.5inch) is possible, please? hi can your pls attach your efi folder for me USB to boot installer with! i followed the Tony macx guide i keep getting errors!